"The enchanting autobiography of the seven-time James Beard Award-winning cookbook author and acclaimed actress who taught America how to cook Indian food. Whether climbing the mango trees in her grandparents' orchard in Delhi or picnicking in the Himalayan foothills on meatballs stuffed with raisins and mint tucked into freshly baked spiced pooris, Madhur Jaffrey’s life has been marked by food, and today these childhood pleasures evoke for her the tastes and textures of growing up. 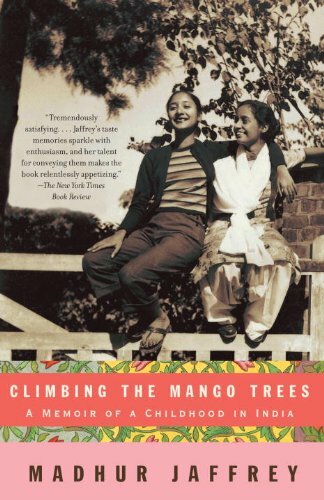 Following Jaffrey from India to Britain, this memoir is both an enormously appealing account of an unusual childhood and a testament to the power of food to prompt memory, vividly bringing to life a lost time and place. Also included here are recipes for more than thirty delicious dishes from Jaffrey’s childhood." A special thank you to book club member, Jo Jackson for the suggestion.